• Is it a whitewater day? 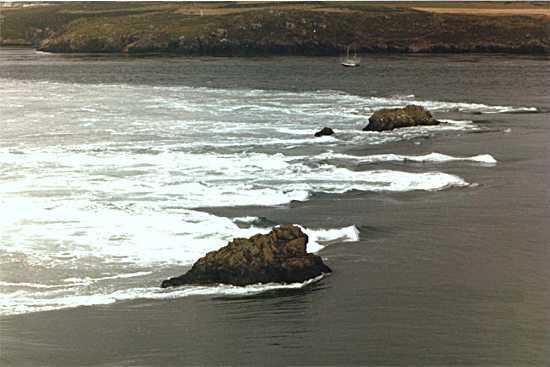 The photo above shows the deep hole which appears next to Ramsey Island at some stages of the tide. Ramsey is off the south west tip of Pembrokeshire, in Wales. The channel between the island and the mainland is called Ramsey Sound. The B-tches [to which we're giving a slightly euphemistic name because we don't want to be blacklisted by Google] is a line of little islands which goes halfway across the Sound. At unusually low tides, you can walk along the chain of islands and hardly get your feet wet. A very fast tidal stream runs through Ramsey Sound for several hours every day, creating conditions which are popular with playboaters. There are often surfable standing waves between the little islands. In the chapter on sea kayak navigation you will find a chart extract of the area. This is a small scale chart, only 1:75,000, so the B-tches are not named but they are shown as a green finger sticking out from the middle of the east side of Ramsey. They are 350 yards wide so you'd need a magnifying glass to see a kayak in this photo, which was taken from 130 feet up on Ramsey looking east. Note the two-masted sailing yacht in the background. There are lots of standing waves, several of which are surfable. Downstream of each little island is a pair of large back eddies, separated from the main current by a turbulent white eddyline. The B-tches can be just terrifying at peak flow on spring tides if there is wind and a powerful swell. This photo was taken on a good play day. The constriction caused by the islands makes the tidal stream speed up a little. Next to Ramsey Island the current pours over a ledge of rock and descends in a 30 degree ramp of fast water. It often goes down about 3 feet, creating a hole which has a stopper wave as its downstream edge. Playboats can enter the hole from above, below or to the side and play in various ways, surfing the wave and doing tricks. At one time there was an annual playboat rodeo on the B-tches with cameras and prizes. It has its own website courtesy of Matt O'Brien, with great photos and tidal stream information. We're not going to give a link to it [Google paranoia again] but you will go straight there if you do an Internet search on "matt o'brien" white water play spot ramsey sound. See also the comments on Horse Rock at Large Back Eddies & Whirlpools. You can take a sea kayak down through most parts of the B-tches with very little fuss. A confident kayaker will try breaking out into one of the back eddies downstream of the islands so as to ferry glide onto one of the standing waves for a little surfing. Even the hole does not, on most days and most states of the tide, present a real obstacle. If you do see a ramp of smooth water descending ahead of you, with a wall of white water waiting for you at the bottom, you will definitely paddle as hard as you can. Your momentum will help the long hull of your kayak cut through the stopper like a hot knife through butter. If you keep paddling hard even when the wall hits you in the chest and face, generally you find yourself down-tide of the hole and still upright. Approaching the hole from downstream is a different matter and takes thought. It is not generally worth dropping a sea kayak into a hole, because there is not much you can do with it in there and there's a significant risk that it will get damaged. If you take a long kayak into a hole from directly downstream, there will come a point when the front of it enters the ramp of fast water flowing over the ledge. It will then be forced under water until it hits the rock ledge (ouch). In a medium-sized hole the water may be deep enough for the entire kayak to go vertical (an ender) and fall over forwards (forward loop). This is fine as long as the ends of your kayak don't hit anything solid, and as long as you are able to roll in the very fast, turbulent water downstream. In a few holes, the water will turn your kayak sideways and hold you. Stuck sideways in a hole? Any stopper likes to turn kayaks sideways and make them drop into the bottom of the slot. If the slot is a foot deep you may find it hard to paddle out again. If it's 3 feet deep, you won't be able to see out and the noise and turbulence will be shocking. The moment you arrive in the bottom of any slot you must raise the upstream edge of your kayak. Edging your kayak downstream is crucial because otherwise the water rushing under the bottom of your kayak will instantly capsize you upstream. In other words, keep that upstream gunwale raised so the water cannot grab hold of it and flip you into an upstream capsize. Keep your downstream paddle blade on top of the breaking wave. See the paddle brace strokes at Keeping A Moving Kayak Upright. In the middle of the wave, the water is flowing vertically upwards so you may be able to support yourself with no more than a low brace. If things are really turbulent, try a sculling brace or high recovery strokes - whatever works! Probably the hole will release you after a few seconds. If not, work your way backwards or forwards to a low point or to the end of the wave. If you capsize and come out of your kayak, a hole at sea will almost certainly spit you and your kayak out straight away. So make sure your friends are ready to chase after you. A dangerous hole may hold onto you even if you come out of your kayak. These are not common on whitewater rivers until human engineers get involved, bless 'em, and they are extremely rare at sea. We know of only one at sea in Britain, at the north end of the tunnel under the Stanley Embankment which takes the A5 from Anglesey to Holyhead. Vacationers heading for the ferry may be only yards above a kayaking drama. It's a playwave for some, but given the right tidal conditions it can be nasty on the ebb. In Snowdonia White Water, Sea & Surf (Cicerone Press, 1986) Terry Storry said "this powerful hidden stopper, which is closed off at both ends, has been known to back-loop sea kayaks, and will be the death of someone some day". It can be difficult at first glance to tell the difference between a friendly standing wave and a dangerous hole. 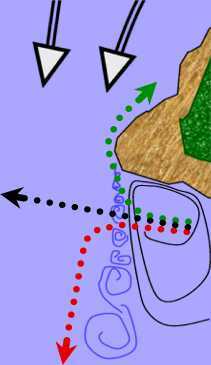 They both have a ramp of smooth water flowing down to a stationary wave. They may both have a breaking crest, and a tail of turbulent water extending downstream from the crest. The clearest sign of a bad hole is that the turbulent water on the surface downstream of the crest is flowing upstream in a wide band across your route (towback). • A vertical or steep ramp of smooth water pouring down into the hole from upstream. Water rushing down a slope of 30 degrees or more can create a very adhesive stopper even if the slot is only 8 inches deep. And the water crashing onto your deck will make it hard to stay upright. • The middle of the stopper wave is further downstream, or further down vertically, than the ends. If you get stuck sideways you will want to paddle towards one of the ends, and it's hard to paddle uphill. • A continuous, regular profile from one side of the channel to the other. This is the sign of an artificial ledge under the water - natural ledges nearly always have a slightly irregular profile which gives the water, and a kayaker, at least one easy point to leave the hole and go on downstream. • Rocks or walls which close off the wave at both ends. Again, usually a sign that human engineers have been there. Like we said, we give some pointers but please don't approach a hole unless you have the necessary experience. OK, that's more than enough about the unpleasant side of fast water. When fast water flows next to land there will be a back eddy or counter-current downstream of every obstruction, separated from the main stream by an eddyline. It's sometimes called an eddy fence because crossing it is not absolutely straightforward. This kayaker has been resting in an eddy, watching a fast stream of water flow right to left on the other side of an eddyline. He has decided to cross the eddyline at a coarse angle so as to enter the fast stream and let it take him off downstream. He is paddling hard and fast to get across the eddyline. As the front of his kayak crosses the eddyline, the fast stream immediately seizes it and starts taking it downstream. In a few seconds the kayak will be moving to the left at the same speed as the fast water. Until then, water rushes from right to left under him. Some of it will build up on the upstream side of his kayak. If he lets it pile up on his right deck it will grab hold of the sharp angle where the deck and hull join and can cause a capsize so fast it's like being grabbed by Poseidon. 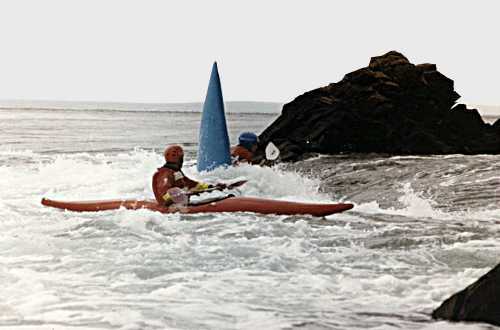 To prevent this the kayaker is edging, raising his right knee and putting the kayak onto its downstream edge as he crosses the eddy line. Keep it like that until your speed has equalized with the fast stream. This keeps your right gunwale up where the fast water can't reach it. Experts often do aggressive edging while sitting upright, sitting in balance so they can continue paddling. However it's quite an unstable position. It's a lot more stable if you lean into the turn and do a low brace on the downstream side. If you misjudge the angle or the speed of the water, the low brace will support you. If you lean towards the paddle blade and press down hard it will also speed up your turn. Say you are coming down a fast stream and you decide to stop in one of the eddies along the edge. You can use the same technique to break out, crossing an eddyline into your chosen eddy. If you come down the fast stream, turn left and cross a distinct eddyline at 90 degrees into calm water, your kayak will be skidding left to right over the calm water. The effect is the same so again you need to edge / lean into the turn, supporting yourself with a low brace. If you're going down a fast stream and you want to break out, turn through 180 degrees and tuck yourself neatly into a small eddy behind a rock, there are times when the best solution is a reverse sweep stroke on the upstream side, aggressively edging your sea kayak to make it spin faster. There are also times when the best turning stroke is a "bow rudder". There's an illustrated article about breaking in and breaking out in short boats on the Gene17 website. You may prefer to start practicing these techniques on a river, where the bank is very close, rather than at sea. Even on a gentle river you can usually find sufficiently distinct back eddies and eddylines just downstream of a bridge pier. Breaking in or out is an aggressive move that requires practice. It's fun but it's not the only way across an eddyline. Let's say you are sitting in an eddy, downtide of a headland. The open sea is ahead of you and the headland is on your right. General tidal streams in the area are 1.5 knots flowing north to south, but the headland accelerates it to an impressive 4 knots. From your point of view, the fast stream is going from right to left. a) The red dotted line shows a kayak breaking in by crossing the eddyline at a coarse angle for the pleasure of being snatched by the fast stream and taken off downstream. b) The green dotted line is a kayak going upstream round the headland with minimum fuss. Place your kayak so that you are in the calm water of the eddy, near the eddyline and parallel to it, with your kayak pointing upstream. Paddle hard, cross the eddyline diagonally but at a fine angle, still pointing almost directly upstream. Keep paddling hard upstream until you get round the headland. Probably you will hardly notice as you cross the eddyline. c) The black dotted line is a kayak crossing the fast stream and going straight out to sea. Proceed as in (b) but after you have entered the fast stream, put your boat at a slightly less fine angle, say 20 to 45 degrees. So your kayak is pointing upstream but angled more towards the open sea. The angle depends on the speed of the current. Keep paddling upstream and the power of the fast stream will gently send you sideways. See below. If you enter a fast stream of water at a fine angle, with your kayak pointing almost directly upstream, the current will not grab the front of your kayak or take you downstream. If your kayak is at an angle of 10 to 30 degrees to the fast stream it will carry you rapidly across to the other side. River ferries use the power of the current in this way, so it's called ferrying or the ferry glide. As you cross, you probably need to paddle only on the downstream side. Keep an eye on your destination to check that you are not going downstream or upstream. If you are, adjust your angle to allow for the speed of the current and the speed at which you are paddling. This is an efficient and satisfying way to cross most tidal streams from 15 feet to 500 yards wide. When doing a ferry glide across a really wide stream, obviously you keep your kayak pointing at a spot up-tide of your target. 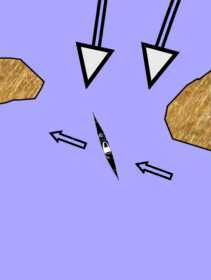 To see if you are going directly across the stream you can keep comparing the position of two stationary objects, one behind the other. See Ranges. Obviously there are limits to what you can achieve with a ferry glide. If the current is too fast, it would be like trying to go straight up a fast river. There comes a point where it is better to forget your pride and go as fast as you can at 90 degrees to the current until you get to the edge. Normal cruising speed is 2.5-3 knots. You can probably go at 4 knots for quite a long time, or sprint at 6 knots for 15 minutes. At some states of the tide, it is possible to do a 3000 yard ferry glide right across the 6-knot currents of Bardsey Sound to the wildlife sanctuary of Bardsey Island, Wales. However the best way across a very wide and fast channel is usually to start some distance up-tide of your destination and paddle straight over with your kayak heading at 90 degrees to the current. Use a chart and tide tables to decide where to start. They will also help you estimate the direction in which to point your kayak. See Adjusting Your Plot For Currents.